Truly remarkable hitting by Aaron Finch and Jason Roy thrilled a sell-out Kia Oval crowd of 24,000 as Surrey chased down a Middlesex total of 221 for five with almost contemptuous ease to win the Vitality Blast London derby by nine wickets. 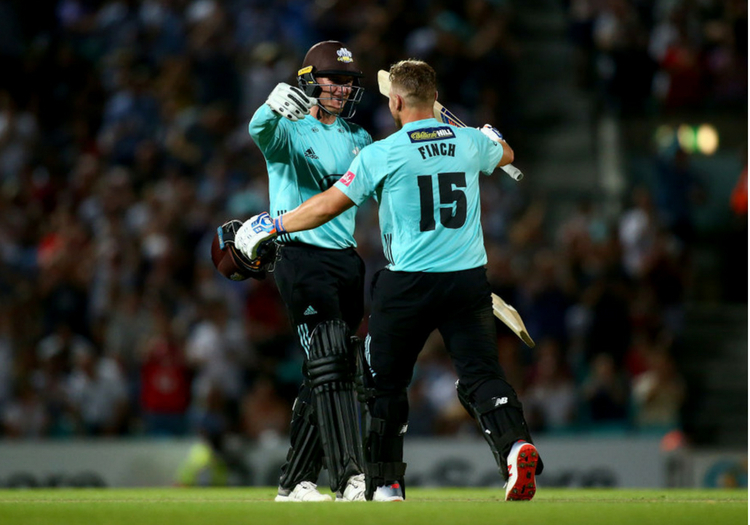 Even Paul Stirling’s spectacular 58-ball 109 was overshadowed as Finch and Roy plundered an astonishing 194 for Surrey’s first wicket – scoring 98 in the initial six-over powerplay alone – to spearhead a victory achieved with a barely believable four overs to spare. It was Surrey’s fourth win from eight South Group games, but Middlesex’s seventh defeat from nine. Australian powerhouse Finch, the world’s No.1 T20 batsman, led the assault by reaching his 50 in a mere 16 balls – unsurprisingly a Surrey record – but England white-ball opener Roy was hardly a slouch, racing to his own half-century in 24 balls. Finch and Roy’s partnership was also a Surrey T20 first-wicket record, beating the 187 they had themselves put on against Kent at the Oval two years ago. Spare a thought for Middlesex’s shell-shocked bowlers as sixes and fours simply flew from the bats of Finch and Roy. Tom Barber’s first over, the second of the innings, went for 17 as Finch plundered three successive fours and poor James Harris, who sent down the third over, saw it cost 23 runs as Finch smashed his first, second and fourth balls for six. 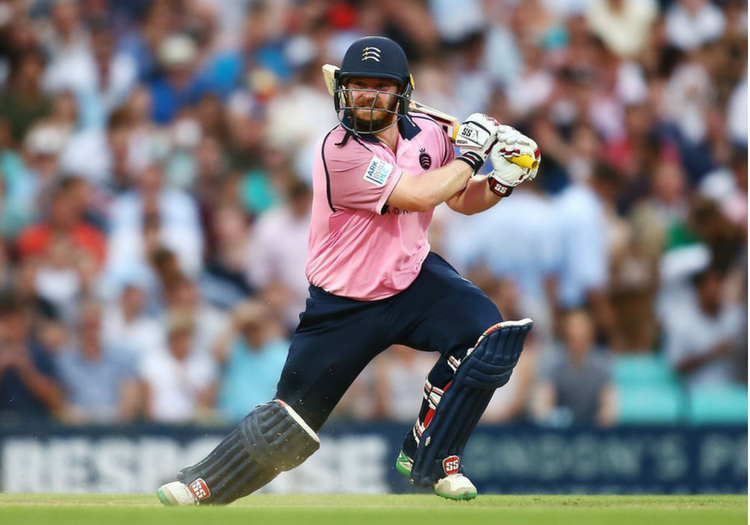 In all, Finch hit eight sixes and 11 fours in his sixth T20 hundred, and second of this Blast campaign, while Roy’s final tally was seven sixes and seven fours. Nic Maddinson then came in to keep Finch company until the win was completed at 222 for one, swinging Barber for a six of his own high over midwicket in his unbeaten 13. Ironically, Middlesex’s 221 for five equalled their previous highest total in T20 cricket, the 221 for two scored against Sussex at Hove in 2015. Nick Gubbins, however, did most of the early scoring with four fours in a quickfire 20 before he was held on the deep midwicket ropes by Tom Curran off Dernbach. Stirling then took over, swatting Mat Pillans’ first ball for six and square cutting his next ball for four. Curran was driven for two offside fours and the six-over powerplay ended with the same bowler being thumped over long on for six as Stirling went to 34 and Middlesex accelerated to 67 for one. Gareth Batty’s off spin was also savaged, with sixes lofted wide of long off and pulled over midwicket. Batty’s next ball, in the 11th over, disappeared over long on for another six and the Northern Irishman reached 99 with his seventh and final maximum, a massive blow launched off Will Jacks’ off spin over wide mid wicket. A single from the next ball took him to three figures, and there were two more fours off Rikki Clarke before the veteran allrounder bowled him leg stump, making room, with the final ball of the 16th over. That left Middlesex 136 for two and, although Eoin Morgan was run out for nought without facing a ball, after a mix-up with Stirling, runs continued to come quickly as Fuller thumped Dernbach for two sixes.